Injury Lawyer Miami | Driving Safety Tips - Shamis & Gentile, P.A. May 29, 2014by Shamis & Gentile P.A. Stay away from the “Fast” Lane: If you happen to be driving on a multi-lane road, such as a highway, try to avoid the “fast” lane on the far left when possible. If you stay in the center or right lanes, you have more accessible “escape routes”, should you need to move out of the way. Lets say you see a car accident just ahead of you in the fast lane; most likely, your only options are to try and slam on the breaks (which might cause a rear end collision from the car behind you) or swerve to the right and pray you don’t hit a car, causing another accident. However, if you are driving in the center lane or the right lane you will give yourself more lanes to turn into to avoid an accident. Additionally, if in the right lane, you would also have the option to pull into the emergency lane to avoid an accident. Be cognizant of your surroundings as you drive: Instead of mindlessly gazing at the car in front of you or staring into the clouds, you should try to observe the car that is ahead of the car in front of you so that you’re prepared for any abrupt stops. 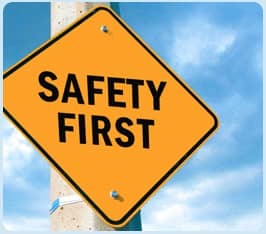 If you concentrate on what is going on ahead of you, you will have a better chance of spotting a potential accident, and ultimately will give yourself more time you to avoid a crash. Remember that while it is important to look ahead, don’t forget to monitor all your surroundings either behind or on either side of you. Make sure that you pay sufficient attention to all possible danger zones. Use the 3 o’clock and 9 o’clock position on the steering wheel: Even though this isn’t necessarily seen as the “coolest” driving technique, it is the safest. Leaning way back with only one hand on the bottom or top of the steering wheel and the other hand down to your side can significantly reduce your ability to avoid an accident; if you need to swerve out of the way to avoid a crash, you should have as much control as possible over the situation and the car’s steering; having your hands at 9 and 3 affords you this control. The old position used to be 10 o’clock and 2 o’clock, however this has been changed due to the fact that airbags were causing injuries to people who drove with their hands positioned at 10 and 2. Keep your vehicle in great condition: Keeping your vehicle in great shape is beneficial for many reasons. For starters, a car in poor condition is more likely to get into a car accident. When we talk about keeping a car in good shape, we mean everything attached to it, especially the tires and brakes. Most people tend to get as many miles as they can out of their tires and brakes because replacements can be quite costly. While we believe smart spending habits, the truth is that when tires and brakes grow older they tend to lose their natural ability to successfully grip the road and stop the car. If you ever find yourself in a situation where you need complete control over the car in order to maneuver it away from an accident, old tires and bad brakes might cause you to slide into the accident ahead of you instead of avoiding it. By keeping your tires and brakes are in good condition you can keep cruising and avoid crashing. Contact a Miami Injury Lawyer at Shamis & Gentile, P.A. Even though safe driving tips are available, accidents are still bound to happen. So, if you have been injured in an auto accident due to the negligence of another, please contact a injury lawyer for a free consultation. You can reach us by calling 305-479-2299 or by emailing us at ashamis@shamisgentile.com. Our Miami injury lawyer at Shamis & Gentile, P.A. look forward to assisting you!